Seems like yesterday we were all celebrating the arrival of long summer days full of fun and sun. Now, the school year has crept back up on us! As the last summer sunsets ease us into autumn, it's time to make a plan for meeting a new school schedule head on. Whether you're headed back to school yourself, or your kids are the ones getting ready for classes, you can give yourself an advantage if you arm yourself with a good routine. 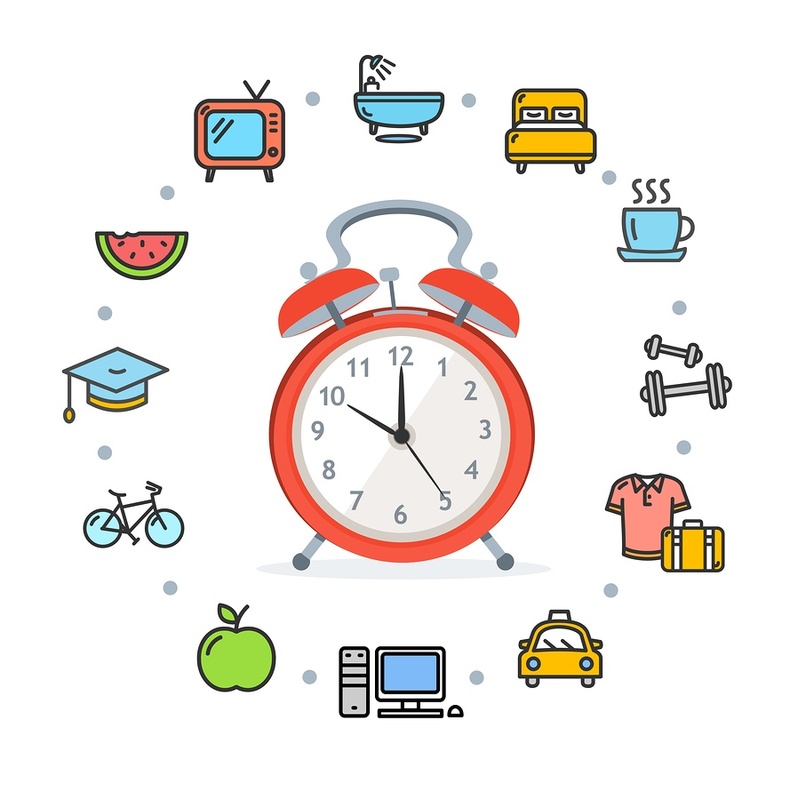 Scheduling your day helps you fit in everything you hope to accomplish including good sleep, proper nutrition, and the exercise you need! People often praise spontaneity as the pinnacle of cleverness and joie de vivre. Yet it can be argued that a well-constructed routine allows for both more enjoyment of life and more opportunities for spontaneous fun. A routine also reduces the opportunity to forget important aspects of your day, which improves your life as a whole. A back to school routine offers an easy, natural structure for parents, kids, and adult students alike. Everyone will be more punctual, better rested, and healthier as a result. Good health begins with a solid night of sleep. As creatures of habit, most humans do best with a consistent schedule for sleeping and waking. We should also be aware of the effects certain substances and situations have on our bodies. As the school schedule takes over, enforce the same bedtime every night. Staying up late to binge your favorite television show on a weekend sounds terrific, but it can mess with your schedule all week. Go to bed at around the same time every night for the best rest. Avoid caffeine, sugar, and other stimulants for the hours leading up to bedtime. Also consider limiting your time in front of electronic screens late in the evening. The blue light from these devices can affect how your body perceives the sleep-wake cycle. Many devices have a "night mode" which removes blue light from the display for less disruption. Still need that extra help for a good night's sleep? Try one of our top selling products, Motiv8 Skinny Sleep. Motiv-8 Skinny Sleep has been proven to be an excellent solution for boosting metabolism, getting a good night’s sleep, and speeding up the fat loss process. As a natural sleep aid, this product works while you rest by boosting the body’s metabolism and burning fat. Planned mealtimes ensure you will have both the opportunity to eat and the chance to eat the healthiest foods! When you don't have to rush to fit a meal in between classes, you are more likely to reach for meals that improve your energy instead of heavy fast foods. Planning also allows you to keep convenient, back to school foods within easy reach for rushed days. If you're looking for all-around help in creating a healthy food schedule, Jax Nutrition's meal plan program can provide valuable assistance for nutrition. We also stock easy-to-grab snack bars, mixes for preparing healthy breakfasts (try our Stack’d Protein Pancakes! ), and other products to make your life simpler. Trying to sneak in workouts around school schedules can feel impossible. Yet you might be surprised by how much exercise you're getting just by attending class! Invest in a wearable fitness tracker to see how much you're already doing. These devices can also help you stick to a routine by providing reminders and issuing challenges for step counts and more. You don't have to set aside large blocks of time to add more exercise to your day. These fast workouts can help you squeeze in a fitness routine between activities. Just a little time each day can have a large impact! Need motivation to get this workout routine started? Try using Motiv8 BURN. Motiv-8 Burn is a fat burner that reduces appetite and enhances mood while providing all day feel good energy! Just what you need to get back into the gym. Contact Jax Nutrition today for advice on how to fit better nutrition and good health into your busy back to school schedule!